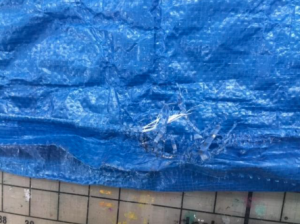 For example, BravoTabs and Clear PowerTape can be used to repair ripped PVC tarps. We had this happen to us recently, and we were extremely happy with the results! 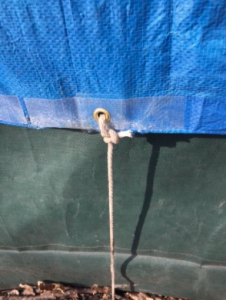 It was a common enough situation – we had a standard PVC tarp which was tied down with metal grommets. Until, that is, 50MPH winds ripped one side completely to shreds. 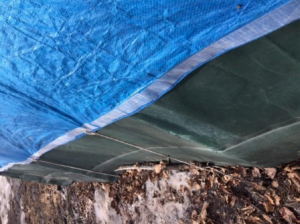 We were left with naked metal grommets still attached to the cords – not the vinyl – and several deep rips across the tarp beginning at where the grommets used to be. So, we thought this would be a great chance to see what our products could do in an unusual application. Ultimately, it was a quick and easy fix that actually increased the tarps strength. Step one was replacing the ripped out grommets with our BravoTabs. It was really easy to stick the BravoTabs onto the tarps surface. This created new super strong fastening points. Not only did the grommets rip out on the bottom but there were several vertical rips into the body of the tarp. This was a job for Clear PowerTape. It was very easy to run Clear PowerTape over the rips and tarp looked good as new. Finally, we had to support the bottoms of the tarp where the rope was going to tie too. Again this was another perfect application for Clear PowerTape. Clear PowerTape is designed to add strength to the edges of banners. So adding it to the tarps edge gave it a huge boost of strength in combination with the BravoTabs. With the edges repaired and tabs in place all it took was a moment with our PowerPunch to easily punch holes to run the rope through. Repair complete! So far, it has held strong against 40MPH winds! For more Banner Ups products and Power Ups quick-fix ideas, just contact us at 800-869-9601 or visit our online form to request a free catalog and sample.